My friend Rabbit means well, but everything he does, everywhere he goes…trouble follows. 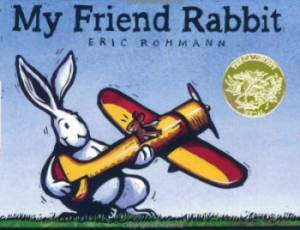 And this is, almost the entirety of Erich Rohmann’s text for the Caldecott1 award winning My Friend Rabbit. What the book lacks in prose it makes up for in visual story. 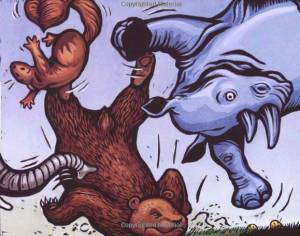 It’s a simple tale of friendship, mayhem and just-missed mauling that will warm the heart of your2 animal loving offspring. Listen to your toddler gasp as the intrepid rabbit stacks the great beasts of the world high in an attempt to retrieve a wayward airplane. Cover your eyes like the young ducklings as three or four metric tons of wildlife come crashing down. 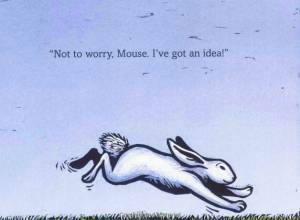 Take comfort in Rabbit’s calm demeanor as he says “Not to worry Mouse. I’ve got an idea” just before everything inevitably goes to pot. But most of all enjoy the illustrations and the Rohmann’s minimalist approach to telling a complex tale of friendship and perserverance. 1 I know, real original recommending a book that’s won a freaking Caldecott. So sue me.